‘Accessorize’ is the name of the game when you own any type of GoPro. There are a few ‘bits’ that come with the camera, but you will soon be wanting for the plethora of add-ons, even inventing ways to use a certain piece of kit (or an excuse to buy something). There’s a huge array of accessories which range from waterproof housings, harnesses, grips, tripods, protectors and the list goes on. Here we will look at some of the more useful and functional accessories which you could add to your next shopping list. Always remember to check before buying if any of these accessories listed below fit your model of GoPro. This is especially pertinent for things like camera housings, batteries, and gimbals. 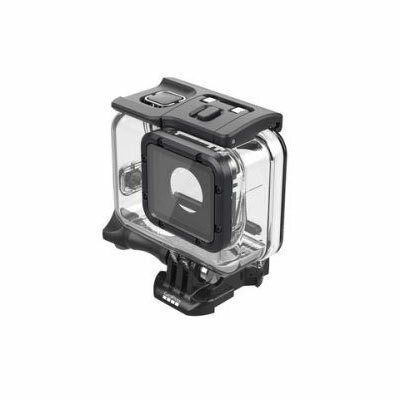 The latest versions of the GoPro have built-in waterproofing, but they are still restricted to a depth of 10m and older versions will need some sort of waterproof housing. The GoPro Super Suit is rated down to 60m (196ft), includes two waterproof backdoors, and works well as a protective shell against all the outdoor elements. Also included is a Skeleton Backdoor to be able to use the touchscreen, but then the Super Suit becomes just a protective case without the waterproofing. Almost an essential piece of kit, even for the newer GoPro models. Owning the best quality memory cards is always a wise move. 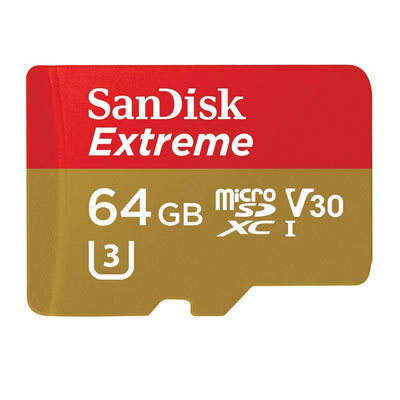 SanDisk’s Extreme series is one of the go to memory cards for rock solid performance and fast read(160MB/s) and write speeds(60MB/s). The latest versions are also waterproof, shockproof, temperature proof and X-ray proof. Memory cards are an area where you shouldn’t skimp in any way and with prices getting cheaper all the time, there is no reason to not own a few of these. They are also 4K ready. Oh no, you’ve bought all these accessories and you just don’t know where to put them. Step in the GoPro Casey which has a weather resistant, semi-rigid shell to protect all your gear. 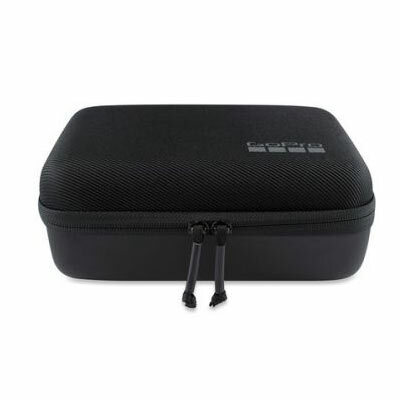 The inside of the case is nicely padded with Velcro, customizable sections and plenty of space for quite a few accessories. There’s also a removable pouch for smaller items such as memory cards and batteries. You can never have too many charged up batteries for a day’s shooting. 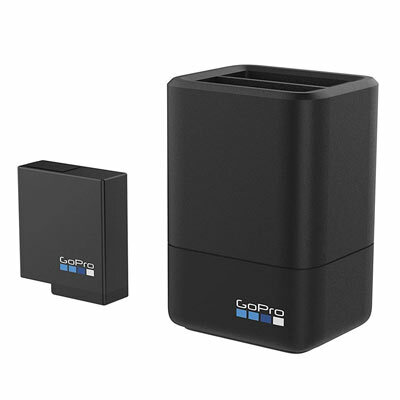 This GoPro charger can charge two batteries at a time and also comes with a spare. A worthwhile addition to any GoPro set up. 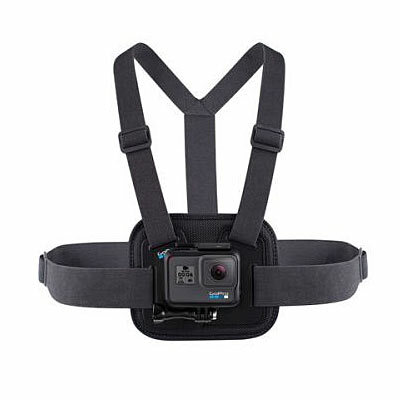 When it comes to attaching a GoPro about your person, the included clips and a bit of DIY can get you a long way, but when you need an ultra-secure mount on your chest, then you can’t go wrong with the GoPro Chesty. The harness like design is extremely secure, made from very durable, lightweight fabric and also features a quick release buckle. It’s fully adjustable with enough length to fit over outer garments. Also, not too expensive and a great addition from anything from walking to extreme sports. Having some sort of stability for your GoPro is essential. 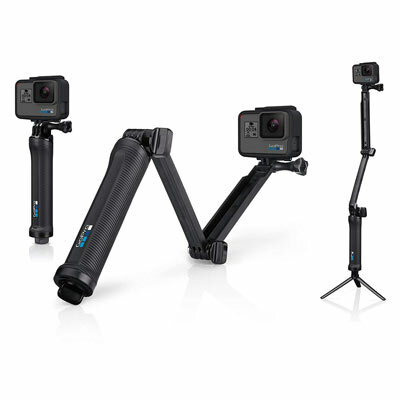 The GoPro 3-Way acts as a small tripod, extension arm and grip all in one unit. 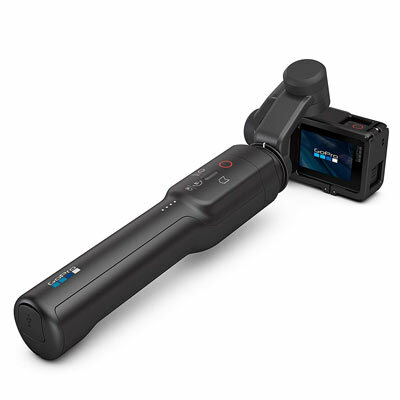 The GoPro 3-Way can extend from 7.5in to 20in., going from being a grip to an extension arm. As a tripod, it acts more like a little monopod with legs which is okay for light to use, but not so good in windy conditions. However, it’s a great all in one accessory. The Karma Grip is a fantastic accessory for getting Ultra stabilized footage which uses a a 3-axis stabilization system to correct movement in all directions. The grip has to first be charged, which can also charge your camera and then the integrated buttons can give you basic control of the camera. It’s a fantastic device, but pricey and is best suited to older models. Many of its features have now been integrated into the Hero 7 Black, or if you have an older model, this is a fantastic piece of kit. 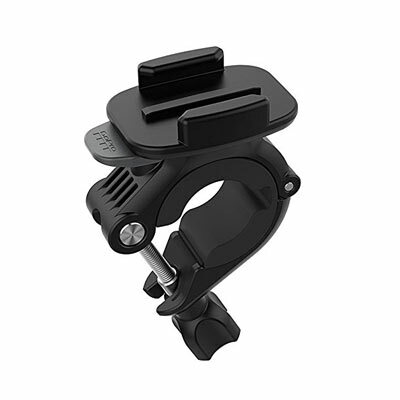 This little device is extremely useful for attaching your camera to things like handlebars or any type of pole. Quickly adjustable with a 360° base, this mount is a great general-purpose device which can be clamped onto any type of round length. I have seen one of these used in many situations, such as being clamped onto a tree branch or at a push, a piece of metal sticking out of a car. It may seem specialized on the surface, but it can be a real lifesaver in certain situations. What would the world be without selfie sticks. 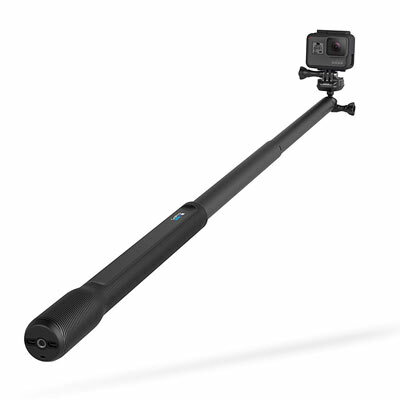 GoPro’s own version extends from 15in(38cm) to 38in(97cm) with a ball and socket attachment for easy rotation and an oversized, covered grip. The stick can Twist-lock into place and is also waterproof, which means it can go surfing or underwater. Much of the action GoPro footage you see online uses the El Grande. The range of GoPro accessories is expanding all the time and whatever your needs, there is surely an accessory out there to fit the bill. The list above isn’t a list of the full range of accessories available, but it should cover many of the applications where you would use an action cam and hopefully expand your creativity. Previous Post« Previous Fitbit Ionic: Did Fitbit’s First Smartwatch Hit the Mark?